There were two things I knew for sure. First, Jaclyn was the one I wanted to spend the rest of my life with. 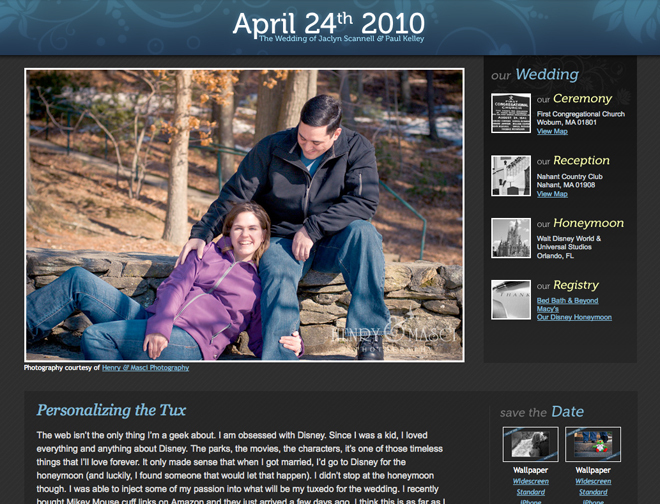 Second, when I got engaged, I wanted to create a small site to talk about our plans and our excitement. This is the result; it’s a small Wordpress powered blog (my first attempt at one by the way) that’s main purpose is to keep everybody updated about our wedding planning. Like any designer, I already have a redesign in mind and I look forward to refreshing it’s look around the first of the year.